If Khadga Prasad Oli’s return to the premiership was inevitable after his party’s sturdy performance in last year’s elections, the timing of his ascension appears to have been conveniently crafted. While the ‘China’s gain, India’s pain’ narrative will be assiduously held, New Delhi appears to have ensured sufficient safeguards against any significant ‘contrariness’ from the Communist Party of Nepal-Unified Marxist Leninist (UML) chairman this time around. Not long after Indian External Affairs Minister SushmaSwaraj invited herself to Nepal to give him that so palpably asphyxiating embrace, Oli finds himself at the helm of a minority government. The much-ballyhooed grand leftist unity is still marred by almost willful obfuscation from the principal protagonists. The Maoists could have sent a minister or two as a confidence-building measure. Ideology, power sharing, personal predilections, or any number of other things could be standing in the way. For now, all we hear is the word ‘inevitable’. Beijing might be happy at the change of guard in Kathmandu, but it will certainly be hard-pressed to identify what there is really to cheer about. It’s becoming increasingly clear that the most formidable opposition to the UML-Maoist Center unification is emanating, not from so-called ‘national and international conspirators’, but from within the two parties. Of course, the distinction may be feebler than it sounds. But you cannot disregard the reality that others get to play only because those within allow them to. If Oli is facing antagonism, if not outright insurrection, from factional chieftains like Madhav Kumar Nepal, the Maoists are not in exactly pristine form, either. Once-acquiescent lieutenants like Krishna BahadurMahara, Ram BahadurThapa, Barsa Man Pun, Janardan Sharma and Top BahadurRayamajhi are becoming more assertive in the organization as the aura of chairman Pushpa Kamal Dahal continues to fade. The fact that these second-rung leaders come from different directions and have yet to fully pursue their own rivalries only complicates matters. On the other hand, caretaker prime minister SherBahadurDeuba seems to have taken enough care to ensure that Oli’s journey would be anything but smooth. How many decisions will the new prime minister have to undo before he can start taking his own ones. And, then, who really knows how many – and what kind of – other ‘inopportune’ decisions the Deuba cabinet might have taken that have not hit the headlines. Then there’s that innately human element. Oli had really stuck his neck out long and hard northward last time. What did the Chinese do for him when the inevitable backlash arrived? He was thrown out like a door mouse. More importantly, how many of us who ceaselessly commended his ‘nationalist’ stand during the Indian blockade do to bolster him in his hour of need? To cut a long story short, where’s the evidence that Oli won’t be a changed man this time around as far as his geostrategic orientation goes? Dahal’s 180-degree flip was softened to an extent by the distance between his two premierships. The relative closeness of Oli’s tenures will perhaps make any such somersault more extraordinary, but it will certainly be no less explicable. 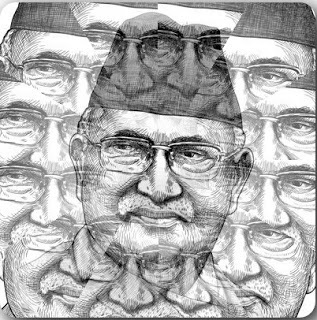 Previous Whether PM Oli will write his name in history?